With oil prices more than double what they were two years ago, you would think companies would be champing at the bit to start new development projects. That isn't the case at Equinor, though. Oil prices have been on the rise and are now at around $80 per barrel outside the U.S. A drastic price increase like that would typically incent producers to open up their wallets and spend on new exploration and development projects. That isn't the case with Norwegian oil giant Equinor (NYSE:EQNR) -- formerly Statoil -- which is maintaining incredibly strict capital discipline, so much so that management even cut its capital spending budget for the year. Is spending less on oil today the right move when the chance of $100-per-barrel oil is no longer a far-fetched possibility? Let's take a look at the company's most recent earnings results and figure out if cutting back spending is the best move in today's oil price environment. Image source: Jan Arne Wold and Bo B. Randulff / Equinor ASA. DATA SOURCE: EQUINOR ASA EARNINGS RELEASE. EPS = EARNINGS PER SHARE. Even though Equinor has some downstream investments and is quickly developing a sizable presence in offshore wind, exploration and production continue to be the engine that power's Equinor's earnings results. So it's no surprise, then, that the company's improvements in earnings and cash flow came from higher oil prices. For the quarter, the company realized an average oil price per barrel of $67.6 compared to $47 this time last year. Data source: Equinor ASA. Chart by author. Average production for the quarter came in at 2.06 million barrels per day, which was up a modest 1.8% compared to the prior quarter and 1% year over year. Its international production segment more than offset declines from its Norwegian Continental Shelf assets and high levels of maintenance activity. Management remained active on the acquisition and sale front as it acquired Chevron's 40% operator interest in the Rosebank project in the United Kingdom. It also sold two offshore discovery blocks in Norway for a total of $470 million. The company continues to make considerable progress on its largest project, the Johan Sverdrup offshore field. After completing the critical pipeline connections this past quarter, the 660,000-barrel-per-day facility expects to be up and running by November of 2019. Even though oil prices are on the rise, management lowered its capital expenditure guidance for 2018 to $10 billion as it focuses on capital discipline. Management anticipates rising costs soon that will eat into returns and is instead focusing on optimizing its current development portfolio. This is for organic capital expenditures and doesn't include the $4.6 billion it has spent thus far on acquisitions and other investments. Management also noted that it had been able to lower the expected development costs of its Norwegian Continental Shelf assets by $3.6 billion. Those gains have no impact on future production rates at those fields. In CEO Eldar Saetre's press release statement, he emphasized Equinor's focus on costs and delivering its existing portfolio of assets on budget to get the most out of today's oil prices. We have achieved significant cost improvements in recent years, allowing us to capture more value from higher prices. We will continue with a strong cost focus to further strengthen our competitive position. As a result of capital discipline and efficient project execution, we are able to reduce our organic capex guiding for 2018 to around 10 billion dollars. Project activity remains high, and we have submitted development plans for the next phases of the high value, low carbon Johan Sverdrup and Troll fields. In October we announced the acquisition of a 40% operated interest in the Rosebank field in the UK and the divestments of two non-core assets in Norway. We also continue to develop our portfolio within renewable energy. The Apodi solar project in Brazil is on track, and we delivered first electricity from the Arkona offshore wind project in Germany. It's a little discouraging to see Equinor's growth plans remaining so modest. Management expects to grow production by 3% to 4% annually between now and 2020. Compared to some of its large oil-producing peers, those numbers are downright paltry. The good news is that management is able to maintain this production growth trajectory while significantly reducing its capital expenditures. Even if growth doesn't look great, this cost discipline should help to improve returns and should also result in higher levels of free cash flow. Also, many of management's portfolio moves should pay off. Acquiring assets like Chevron's Rosebank and the Roncador field in Brazil gives Equinor an advanced development portfolio that significantly reduces exploration risk. All things considered, Equinor's strategic plan isn't a bad one, but investors shouldn't expect huge gains from this stock, either. 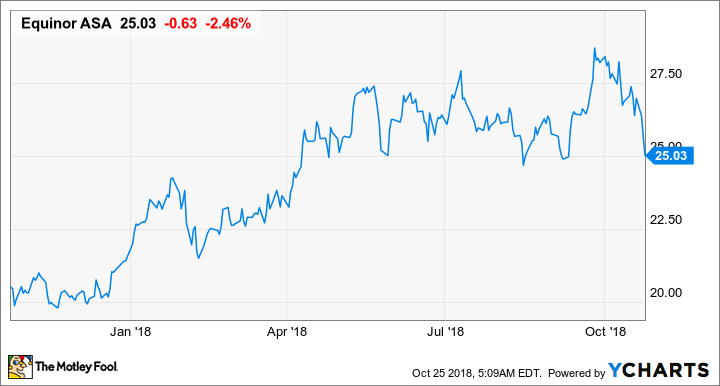 With shares trading at 18 times earnings -- the high end of its peers -- and one of the slower growth plans in the industry, Equinor's stock just doesn't look like one of the better investments you could make right now.